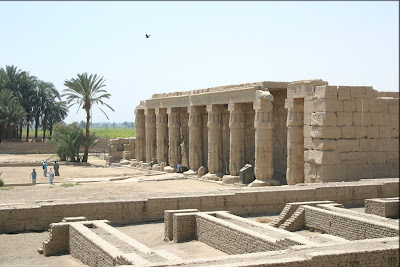 The monuments that are most frequently visited at Abydos are the New Kingdom temples of Seti I and Ramses II, and not those for which the ancient city was famous. The cenotaphs of the ist and 2nd Dynasties are no more than ruins. Of the great temple of Osiris at Kom el Sultan, only the granite doorways and paving stones remain. The many cemeteries of different periods are not tourist sites. The temple of Seti I, however, makes a visit to Abydos well worthwhile because it is decorated with some of the finest relief sculpture of any age to be found in the Nile valley. Moreover, the reliefs of the nearby temple of Ramses II are so finely carved that they lead us to suspect that the temple was constructed at the beginning of his reign, and decorated by the very artists who worked under his father, Seti I.
Seti I was the son of an army officer. In fact, he himself commanded the frontier garrison at what is known as Kantara in the eastern Delta. When he came to the throne in 1318 BC, he proved to be one of Egypt’s most able pharaohs, known particularly for encouraging an artistic and architectural revival. Seti I seems to have desired a return to the orthodox canons of Egyptian art after the breakaway art movement in the ‘Amarna period’ (page 118). The representations in his temple are majestic, delicate and conservative; they also have an additional quality reminiscent of the naturalism of the Amarna period; emotional expression. Although the many representations of Seti appear to be alike, on close scrutiny they will be seen to be slightly different from one another. As he looks into the face of an honoured deity, for example, his expression is one of reverence. Before a goddess, there is a look of loving trust. Before one of the great gods, he bends slightly at the waist to indicate awe. This latter pose is not to be found in any representations of the 18th Dynasty, w here the pharaoh always stood proudly erect and exalted. The gods, too, are depicted with human emotions. Osiris looks benevolent and majestic. Isis is gracious and tender. Horus is competent and direct. The temple of Seti I is built of fine-textured limestone and has many unique features: one is a wing at the southwest corner (compare with traditional temple page 63), another is the so-called Osirion (page 28), and, most unusual, is the seven-fold dedication. The temple of Seti has sanctuaries for Osiris, Isis and Horus (the Triad associated with Abydos), Ptah the god of Memphis (the first capital of a united country), Ra-Harakhte (the Sun-god of Heliopolis), Amon-Ra (the ‘King of Gods’ and God of Thebes) and the last shrine for Seti himself. The Entrance Pylon and First Court (i) are in ruin. Only the rear section of the Second Court (2) is preserved. It is approached by a graded stairway leading to a terrace on which there were twelve square pillars; on each pillar Ramses II, son of Seti I, is depicted embracing the principal gods of Egypt. The text on the walls to the rear relate, at (a), that when Ramses came to Abydos and found that the temple of his father was unfinished and neglected he completed it for him. To the left of the central doorway (b) is a large representation of Ramses offering the symbol of Truth to Osiris, Isis and to his late father Seti I. To the right of the doorway (c) there are representations of Horus, Isis and Seti I, following which, at (d), Ramses II is shown beside the sacred tree of Heliopolis. Ptah, god of Memphis, writes his name on the leaves. Thoth, the god of Wisdom, records the event. Ra-Harakhte presents Ramses with the royal crook and flail. Behind Ra-Harakhte, Osiris is depicted. The first Hypostyle Hall (3) is 60 metres wide and about 14 metres deep. It is roofed and supported by 24 papyrus-bud columns arranged in pairs. The hall was originally designed to be entered through seven doorways, which led to another seven doorways, and ultimately to the appropriate shrine of each of the seven deities. All but two were, however, blocked by Ramses II. The decoration of this hall was also carried out by Ramses II. He is shown making offerings to, or obtaining blessings from, the various gods and goddesses. Noteworthy are the scenes showing his active participation in planning the temple. At (e) he is depicted facing the goddess Seshat, patron deity of records and archives; the goddess is driving stakes into the ground to measure out the ground- plan. Behind Seshat is Osiris, who watches over the activities being conducted on his behalf. Above this scene Ramses breaks ground with a hoe before Osiris. Further along, at (f), Ramses, assisted by Horus, stretches out a measuring rope. Also noteworthy are the scenes showing temple rituals. All those entering a holy shrine, even royal personages, had to be barefooted and ceremonially pure. Certain acts of ablution were supervised by the priests. This rite is depicted to the left of the entrance doorway (g) where Seti is purified by Amon-Ra of Thebes, and Atum, ancient sun-god of Heliopolis. They pour the emblems symbolising Life and Prosperity over Seti from golden vessels. Near the left- hand corner (h) Seti is purified with water by Thoth and Horus. He is being suckled by Hathor the cow-goddess (i), and is presented to Ptah by Khnum the ram-headed god (j). To the left of the doorway leading to the Second Hypostyle Hall, at (k), Ramses makes an offering to Amon-Ra and Mut, his consort. To the right (1) he offers them statuettes and burns incense before them. In the corner (m) he presents to Osiris, as owner of the temple, the title deeds that have been written on papyrus, rolled up and placed in an ornamental container. 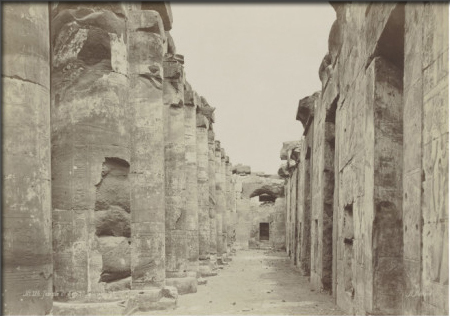 The Second Hypostyle Hall (4) is divided into a front section that is supported by twenty-four sandstone papyrus-bud columns in pairs, and a platform to the rear; the latter forms the threshold to the seven sanctuaries. Turning to the right-hand wall (n) we find Seti in one scene offering incense and water to Osiris, whose son Horus stands behind him. In the second scene Seti I is shown before a shrine in which Osiris is enthroned (o). This is one of the finest reliefs to be found in the Nile valley. Standing before him are Maat, goddess of Truth and Justice; Renpet, goddess of the year; Isis, who gently supports his arm; Amentet, a goddess of the dead; and Nephthys, sister of Isis. The seven shrines, from right to left, belong to Horus, Isis, Osiris, Amon-Ra, Ra-Harakhte, Ptah and the deified Seti I. The walls between the doorways have niches for offerings. The chambers are decorated with reliefs of Seti making offerings to the appropriate god or to a member of his family. Each shrine has a vaulted roof decorated with stars, flying vultures and Seti’s name in oval ca rtouches. To the rear of each shrine, apart from that of Osiris that leads to the Hall of Osiris in the rear, is a representation of a false doorway, a freize of cobras and a place for a model boat in which the gods themselves made pilgrimages. On feast days these boats would be carried in procession, supported on poles resting on the shoulders of priests. The representations in the seven shrines depict daily ceremonies performed in each, including the burning of incense, perfuming and anointing the statue of the god, and adorning it with crown and jewels. In the Shrine of Horus, for example, Seti is depicted entering the shrine bearing an incense burner and a libation vase. He opens the doors of the shrine and the various scenes show him offering water and incense to Horus, placing the Double Crown of Upper and Lower Egypt upon his head, adorning him with a necklace (known as the menat), the usekh collar, and strips of linen that symbolise clothing. Having completed these gestures, Seti leaves the shrine, sweeping the floor behind him in order to remove his footprints. Similar scenes may be found in the shrines of Isis, Osiris (where some of the figures were damaged by early Christians) and Amon- Ra. All the reliefs are in beautifully preserved colour. In the latter shrine Amon-Ra is depicted in mummified human form and is painted blue. He wears a flat-topped crown and two tall plumes. He is also depicted as Kamutef in ithyphallic form. In another representation the boat of Amon-Ra is shown, with smaller boats for his wife Mut and son Khonsu. The shrines dedicated to Ra- Harakhte and Ptah have similar scenes, but the last shrine, that of Seti, is different from the others. Shrine of Seti I: Instead of representations of Seti honouring different deities, who, in turn grant him life and prosperity, a priest, representing the god Horus, addresses the nine gods of the Ennead of Heliopolis - Atum-Ra (the Sun-god), Geb (earth) Nut (sky), Shu (air), Tefnut (moisture), Osiris and Isis, Set and Nepthys - on behalf of Seti. We find the goddess Seshat, patron of writing, recording Seti’s name and titles. Seti is depicted seated between the goddesses Nekhbet and Wadjet (the vulture and the cobra) that represent Upper and Low er Egypt. Thoth, the god of Wisdom, and Horus, bind together the lotus and the papyrus in a gesture that represents the unity of the Two Lands, beneath the king’s name. A priest recites the list of offerings that should be presented to the soul of the deceased. Seti is also shown seated before a table of offerings, with Thoth reciting the offering list. Above him is his royal barge. The three figures beneath the boat are statues of Seti himself, his father, Ramses I, and Queen Sat-Ra, his mother. A scene from Seti’s jubilee shows him seated on a throne borne aloft by three hawkheaded and three jackal-headed figures representing the ancient capitals of Egypt. Between the shrines are facades in marvellously preserved colour. That between the shrines of Horus and Isis (p) shows Seti receiving the emblems of Upper and Lower Egypt from Horus, and the symbol for a Long Reign from Isis. Below he is embraced by Horus, and receives the symbol of Life from Isis. The fafade between the shrines of Osiris and Amon-Ra (q) shows Seti, in the lower scene, seated like a child on the lap of Isis, who caresses him and refers to him as her son. To the left he is embraced by Khonsu, son of Amon- Ra, who holds symbols Life and Prosperity to his face. The Hall of Osiris (5) (approached from the Shrine of Osiris). This hall is twelve metres long and ten metres wide with its roof supported by ten columns. Though it was used by the early Christians, and the hands and faces of the figures were destroyed, the reliefs still retain their original colour. The three small shrines to the right are dedicated to Isis, Seti in Osiris form (i.e. deceased) and Horus. In the shrine of Horus (r) Seti washes a golden offering table with his hands while Horus extends the emblems of Life, Stability and Long Reign to him. The inscription proudly records ‘Washing the offering-table by the king himself’, while Horus declares ‘I give you years like those of the Sun-god Ra.’ Seti presents incense and libation water to Osiris and Isis. Horus throws a stream of incense into the hot brazier. In the shrine of Osiris (s), Seti (here identified with Osiris) has holy water poured over him by Horus. The water comes in three streams from triple vases of gold; one stream is in the form of the emblems of Life and Prosperity. Thoth, the god of wisdom, presents the symbol for Life to Osiris and also holds the symbols for each of the Two Lands. Finally, Seti is depicted in the robes of a funerary priest reciting prayers for the dead. In the shrine of Isis (t) the gentle Isis is shown embracing, protecting and honouring Osiris, Seti, and her son Horus in turn. She stands behind Osiris, holding him with her left arm, and according to the text, she says: ‘My two arms are behind thee; I embrace thy beauty.’ Then, Seti offers her water and incense and a tray of offerings of bread and fruit, meat and poultry. On the rear wall (u) of the main hall, Seti I anoints the standard of Abydos while Isis caresses it. To the left is the Djed pillar which is ceremoniously raised and placed on its base, symbolising resurrection. Seti offers it strips of linen, in the manner of the adornment of the gods in the various shrines. Then, he lowers it and hands it to Isis for safekeeping. The Southern Wing of the Temple is composed of a Hall of Sokar (6) and the famous Corridor of Kings (7). Also, there is a western corridor started by Seti but completed by Ramses II; a Hall of Boats where the sacred barges were stored on stone benches along the walls; a court for the slaughter of sacrificial animals; and other chambers for administrative and storage purposes. The Corridor of Kings contains the famous ‘List of Kings’ beginning with Narmer and containing seventy-six names in oblong cartouches. This important historical record, apart from some notable chronological discrepancies, provides the list of Seti’s royal ancestors. The scenes in this corridor give prominence to the young prince Ramses, who was later to reign as Ramses II. He is shown four times as a child helping his father, Seti I, in various religious ceremonies and reading from a papyrus. Recent excavations have been carried out in the rectangle formed by the main temple and the wing (8). A complex of mud-brick structures was cleared, revealing a large number of store-rooms and also a palace with enthronement hall where Seti received ablutions and observed the progress being made on the building of his temple.